The processor is powerful enough to handle the full range of LTE communications capabilities, including video streams. The internal memory provides ample storage for custom scripts, software applications and a wide variety of protocols. 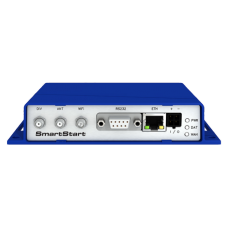 In addition to its Ethernet and RS-232 ports, SmartStart™ has built-in digital I/O connectivity. Competing routers in the same price range generally provide only Ethernet or RS-232. StartSmart™ provides all three. SmartStart™ provides best-in-class power consumption combined with LTE performance, and is optimized for solar and battery powered applications. Low Power Mode extends battery life by dropping power consumption to 40 mW, and can be triggered by timers, low voltage detection or I/O. SmartStart™ is the industry’s only cellular gateway with power consumption equivalent to 2G devices. It is DIN rail and panel mountable. The router supports VPN tunnel creation using various protocols to ensure safe communications. The router provides diagnostic functions which include automatic monitoring of the wireless and wired connections, automatic restart in case of connection losses, and a hardware watchdog that monitors the router status. SmartStart™ is an excellent fit for applications that are migrating to LTE technology. SmartStart’s™ provides fallback to 3G/2G technologies to ensure that connectivity is reliable in areas where LTE is still under development. This future proofs your existing installations and protects your investment. You can upgrade your systems according to your own schedule, as SmartStart™ will continue to connect your legacy devices, even after the cellular providers sunset their 2G and 3G cellular networks. SmartStart™ is easy to install using SmartWorx HUB™ – a full featured configuration and monitoring tool. Our VPN configuration tool, SmartCluster™ makes it easy to configure multiple routers via the same VPN tunnel. Click here for the SmartStart datasheet.